Letterman created broadcasting moments that defined the talk shows of today, and perfected a dry, ironic comic style that transcended his medium of television. Letterman is one of the most famous stars in America, yet there is still a lot of mystery around him and his career is widely misunderstood. 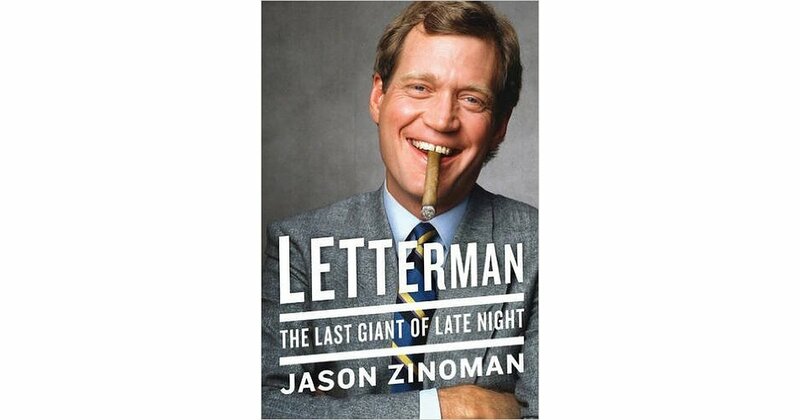 In his exhaustive work, LETTERMAN, The Last Giant Of Late Night , Jason Zinoman, who was the first comedy critic in the history of the New York Times, mixes groundbreaking access and probing critical analysis to explain Letterman's legacy. The book spans from he early days of Letterman's life growing up in Indiana to his retirement. Zinoman emphasizes that a lot of what is done now, like man-on-the street remotes, originated with Letterman. He also is most famous for his witty Top Ten lists, which have been copied in various forms. Letterman makes the case that the legendary late night host had three artistic periods, each distinct and part of his evolution as an artist. 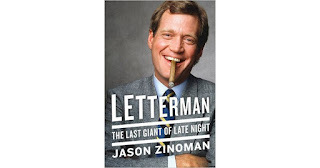 Unlike most analyses of late night TV, Zinoman doesn't just focus on Letterman, but the process of the show and collaboration were essential to his art, including his relationship with his writers and the co-creator of Late Night, Merrill Markoe, whose decade-long romance with Letterman is one of the backbones of the book. "David Letterman entered the national consciousness in the early 1980s, when the roiling revolutions of the Not Ready for Prime Time Players of the original Saturday Night Live were in transition, and the most popular comedian in America, Steve Martin, had just retired from stand-up comedy," writes Zinoman. "Late Night with David Letterman went on the air at 12:30 a.m. when that seemed much later than it does now. Before the internet and thousands of cable channels changed the cultural landscape, Letterman's main competition was reruns, old movies, and sleep. Late Night started with shots of empty New York streets followed by the camera panning up a dark skyscraper before zooming in on one lit-up window. The opening carried a distinct message: This is the only thing on right now that matters. "Once Letterman walked onstage, standing in front of a makeshift set, he talked in a way that suggested he had a secret he wasn't telling you, a sneaky joke, implied but rarely stated. He got his point across in askance glances, deep sighs, and arched eyebrows. David Letterman hosted his talk show the same way he got married, participating in its conventions while providing mocking commentary on them at the same time. His jokes distanced him from what he was taking part in, but they also articulated a certain neurotic point of view. At the end of his many layers of ironic distance, Letterman could be hard to read, but what made him so fascinating was that something seemed to be bubbling underneath the surface, a tortured personality with a self-lacerating streak." He writes of why Letterman stood out and what gives him the authority to write this book, "I became a devoted David Letterman fan not long after I first turned on a television. Outside of cartoons, the shows I liked best as a child were sitcoms scored to laugh tracks. Talk shows seemed grown-up and boring - until I saw Late Night. Along with its dark, unfinished design and intimate nightclub mood - it didn't sound like any other comedy on television - what struck me most was how aggressively disinterested the host seemed, as if he thought everything around him was absurd or phony or both. his attitude was that of an irreverent kid who refused to take anything seriously. "Letterman represented a version of New York cool that seemed more accessible that punk singers in ripped shirts or dapper sophisticates on Broadway. He wore white sneakers, unkempt hair, and a conspiratorial expression. His smirking tone was so consistently knowing that he seemed as if he must know something. "In the 1980s and early '90s, during the first comedy boom, when clubs sprouted across the country and stand-up became one of the quickest routes to sitcom stardom, Letterman inspired an entire generation of comedians. He created a blueprint that was followed by almost every late-night show with an adventurous bent, and helped define a sensibility that changed the entire culture. At a time when talk shows were still trafficking in the chummy sensibility of the celebrity roast, David Letterman brought a certain kind of knowing, ironic, and elusive voice into the mainstream. "Letterman wasn't the first late-night talk-show host of the most popular or powerful one. But he was the most influential. Letterman didn't create just two network television franchises and produce some of the funniest, most innovative comedy in the history of television, in a career that spanned more than six thousand hours of performance. He created a new comic vocabulary that expanded our cultural sense of humor and made a persuasive case for the daily talk show as an ambitious art form. "By the time he retired, there were more talk shows than ever before, and yet they were radically different from the shows that were on when Late Night with David Letterman first aired. The proliferation of entertainment options has fragmented the culture and changed the way we watch these shows. You don't need to stay up anymore to see late-night television, and going viral matters almost as much as ratings. Talk shows have become collections of parts as much as unified wholes, and they were more likely to reach niches than mass audiences. The late-night talk show still looms large, but Letterman is its last giant. "How did a repressed Indiana weatherman who dreamed of hosting The Tonight Show put on a distinctly New York show that was a rejection of the conventional show business world? What enabled this quintessentially detached ironist to become the most emotionally galvanizing entertainer on television in the wake of September 11? Letterman the man was guarded, shy, and fiercely private, and yet he spent decades revealing his changing mood to millions of people every night. His contradictions only make him more compelling, not just to his audience but to his peers. 'He's like our Bigfoot,' Judd Apatow said of Letterman's reputation among comedians." Letterman's career was also defined by the battle between himself and Jay Leno after Leno got The Tonight Show in 1992 when Johnny Carson retired. In response, Letterman left NBC in 1993 and started the Late Show on CBS. Zinoman writes of the ultimate late-night battle, which was a lot fiercer than the Jimmy Fallon-Stephen Colbert battle of today, "it was a due between stark opposites: the difficult artist versus the blue-collar everyman, the ironic absurdist against the punch-line specialist, the acerbic smart aleck facing off with Mr. Nice. "This was how the media portrayed the rivalry between David Letterman and Jay Leno. However simplified the contrast may have been, it did make for great drama. As much as the shows themselves, this competition put late-night talk at the center of popular culture. But the late-night war, as it was called, would not be won or lost in the press. Ratings (and the hundreds of millions of advertising dollars that come with them) are what matter in network television, and when the Late Show with David Letterman premiered on August 30, 1993, opposite The Tonight Show with Jay Leno, the comedians were in competition for the same audiences looking to be entertained at 11:30 p.m.
"The Tonight Show, the signature late-night talk show for nearly half a century, had always led the pack, boosted by the power of the NBC lineup and a series of likable comedies at the helm. David Letterman ended this remarkable run. The CBS Late Show proved to e a hit right from the start. Bill Murray was Letterman's first guest, just as he had been on Late Night with David Letterman, and not long after he rushed onstage, he told Letterman he had some advice. He explained how Chevy Chase (who would start an infamously terrible talk show on the Fox network one week after Late Show premiered) had told him it's important to get your name out there. He took out a can of spray paint and spelled DAVE on Letterman's desk. "Two weeks after Letterman started his new show, Conan O'Brien, a former Simpsons writer plucked from obscurity by Lorne Michaels, started his hosting tenure at Late Night with a video that portrayed him preparing for his new job, walking through the streets of New York as strangers repeatedly compared him to Letterman (Tom Brokaw warned, "You better be as good as Letterman") until finally he arrived at his office and decided to hang himself. The intimidating prospect of following David Letterman was the subject of a joke even on the network that he'd spurned. O'Brien would eventually establish his own distinct style. Six months after his premiere on CBS, Letterman returned to his old studios to appear on Late Night. O'Brien asked him if he was surprised by how much attention leaving Late Night and moving networks had received. "I had no idea it was that important," Letterman said, then couldn't resist a shot at his old employer. 'And NBC had no idea it was that important.'" The move from NBC to CBS and from 12:30 am up to 11:30 pm changed Letterman's style, Zinoman writes. "In his last years at Late Night, Letterman had always been blunt about his feelings and exposed more of himself, turning it into comedy. He continued in this vein at CBS, but it was more difficult to indulge his oddball streak on the Late Show. In part this was due to the earlier time slot and the pressure of appealing to a larger audience, but it also had to do with leaving the studio for the Ed Sullivan Theater. Letterman now had a huge 461-seat home that was much more unforgiving to jokes that bombed than his intimate studio had been. This had a significant impact on the show. The band became larger, and (Paul) Shaffer played loud music when guests appeared." In a way, as Zinoman points out well here, Letterman's CBS show was more traditional than the one he did at NBC. However, that did not take away its uniqueness and the fact it is missed. This book is an essential read for people longing for when late night was filled with the titans of the genre and a compelling figure like Letterman.